Solargain PV Pty Ltd was selected from a number of tenderers to design, install and commission PV systems at these sites with the aims of bringing down operating costs and offsetting greenhouse gas emissions. The systems are optimised according to usable roof area, site electrical loads and energy saving targets. Each system comprises 133x Suntech 300W PV modules and a duo of SMA 15kW inverters. The systems feature large solar panel to inverter ratios to allow the systems to maximise production during the start and end of the day, and during cloudy periods; in effect running the inverters closer to their maximum output for longer. It’s what they were designed for! Solargain’s scope also added walkway and access points in strategic locations to both roofs. This reduced installation times but also minimised wear and tear ‘boots on the roof’ contact. It will also allow faster and safer maintenance of the on-roof components in the future. The Rushton Park Peel Thunder Football Club solar power system sits landscape on low-angle tilt frames. These tilts allow the system to harvest increased solar energy from a less than perfect facing west sloping roof, and make up some of the shading losses caused by the decorative pillars on the upper edge of the roof while making optimum use of the space available. Both systems are monitored through Greensense View and are live on SMA’s Sunny Portal. 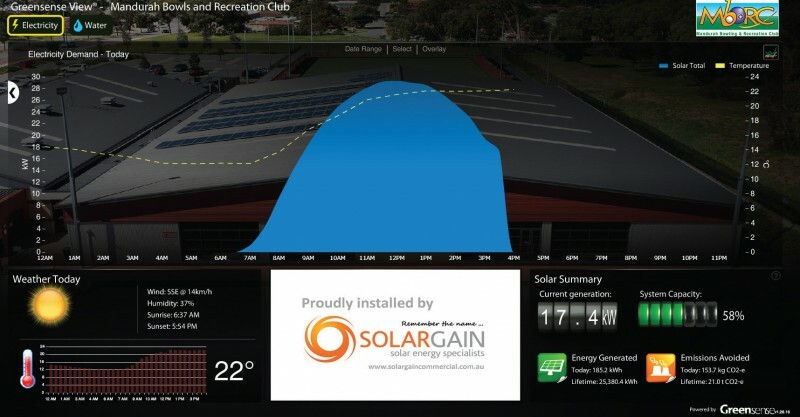 Solargain and the City of Mandurah receive automated reports from these systems and if a fault were to occur, Solargain would receive notification of that too, providing an opportunity for quick resolution. Solargain continues from strength to strength through a combination of high quality accredited workmanship, outstanding customer service and excellent value.